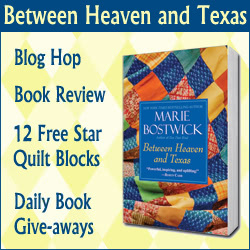 Welcome to my special day for the Between Heaven and Texas Blog Hop celebrating the release of Marie Bostwick’s latest book. I have been a huge fan of Marie’s Cobbled Court Quilt Series since the very beginning. Last year, I helped celebrate the release of her fifth book in that series, Ties that Bind, and was delighted when she asked me to organize another blog hop for her new book. Over the coming 10 days, I hope you will enjoy visiting the talented designers, entering their give-aways and making their star-themed quilt blocks. Also, I do hope you’ll also make an extra block or two to send to Jennifer of Sew Hooked, as she’ll be putting together the blocks into quilts for The Linus Connection. More info here on this charity initiative. We have a Flickr group set up for you to share your completed blocks and you can follow along on Facebook too. 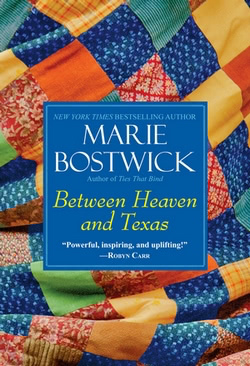 Like all of Marie’s books, Between Heaven and Texas succeeded in sucking me right into it. I’d been rearranging furniture and doing Spring cleaning on the weekend, when I went to take a 15 minute break. Four hours later, the book was complete and the house cleaning was not. Of course, the book left me wanting more, and I’ll be eagerly waiting the next addition to this new series. 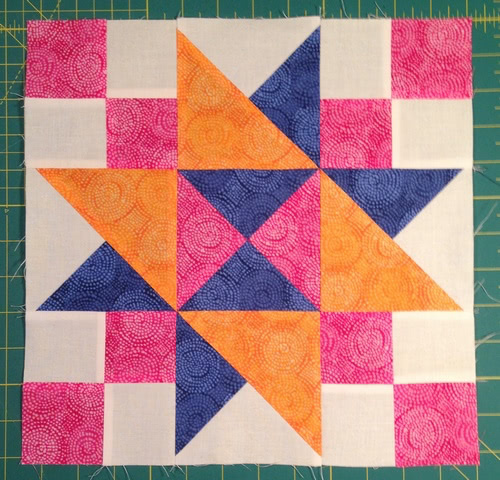 Here’s my free block tutorial: Star of Hope. Download the free block tutorial here! I have a copy of Marie’s book to give away to one of my blog visitors in North America. If you’d like a chance to win, leave a comment below answering What’s the last book you read or audio book you listened to? I’ll randomly pick a winner on Sunday, May 5th. Fifty Shades of Grey (blush). I think Marie’s book will definitely be a more appropriate book for my library. The Love Dog by Elsa Watson, Thanks for the giveaway, love the block. I have just finished Isabelle Allende’s book “Island Beneath the Sea”, which I would highly recommend. Great book! Makes you think a lot!! I just read Casual Vacancy, sure would enjoy reading or listening to Maria’s new book. Thanks for the star block, great fabric colors. I just read The Unlikely Pilgrimage of Harold Fry. Amazing! The last book I read was The Crocodile Bird, by Ruth Rendell. I would be so excited if I win Marie Bostwick’s new book. Thank you for doing this drawing! The last book I read was “Murder Below Montparnasse,” by Cara Black. The last audiobook I finished was “The Kitchen House.” Great narrators! Civil war era prejudice visited upon a plantation. Main character is a woman,who as a young child was orphaned on immigrant ship to America and adopted by the Captain. Brought to the Deep South form Ireland, a drastic change. Plot thickens!! I am almost finished reading “Wolf Gift” by Anne Rice. Haven’t read a book of her’s in years. It could use a quilt or two in it! Thanks for putting this blog hop together. If I ever get my website up and running I will offer to be one of your hosts. I am reading “The Giving Quilt” by JC, and listening to “The Wanderer” by Sheryl Woods. Just downloaded Marie’s 1st book in her series and looking forward to listening to it while I sew. I am reading Proof of Heaven by Eben Alexander a neurosurgeon who was brain dead and recovered. It is an amazing book. I started reading it and started over because I knew that I had hastily read some parts and was having trouble comprehending the information he has to share. I’m not saying it’s a hard read. I was trying to skim and do other things at the same time. Thanks for the wonnderful Star of Hope block. That fits right in with the book. Thanks for the marvelous giveaway. Someone is going to be very happy. My last one was “A Wild Sheep Chase” by Haruki Murakami and I loved it. Thanks for the lovely block! What’s the last book you read or audio book you listened to? 2. The Power of Praying Boldly by Will Davis Jr. I just finished “Growing Up Amish” by Ira Wagler . Thanks for the opportunity to win the book! Honestly, the latest book I read was Ephesians from the Bible. It took on a whole new meaning to me as we had just returned from a cruise including Ephesus, Turkey. I have some of that same fabric. I think I will have to use it when I have this block up! Last fiction book was “Torch”. I’m reading a memoir called “Split at the Root” by Catana Tully that is really interesting. She is a talented black lady who grew up in Guatemala, raised by a white German family. I’m currently listening to The Christmas Quilt by Jennifer Chiaverini and I’m reading Dangerous Refuge by Elizabeth Lowell. While I have been quilting away at a queen quilt for my daughter, I listened to Maeve Binchy’s Scarlet Feather novel on auio tape. Thanks for the chance to win Marie Bostwick’s new book set in my State! This block is BEAUTIFUL…. I am really into stars right now so I really love your tutorial and pattern. Thank you so much for sharing your skill and talent with us! Currently reading a free Kindle book, The Last Bride of Balymede (sp). Love your block and this blog hop is fun. What a lovely block! I just finished listening to Captive in Iran – a true story. Thanks so much for the giveaway! I LOVE Marie Bostwick’s books and have read all of them. Where We Belong by Emily Griffin is the last book I read. Thanks for the tutorials! I’d love to win the book! The last book I read was Mind Thieves by Lori Brighton. I have read all of Marie’s books and would love to win a copy of this new one. Thank you for your tutorial. This is a great book to win. Thanks for the chance. The last audio book I finished was Destiny of the Republic: A Tale of Madness, Medicine and the Murder of a President by Candice Millard. It was wonderful, and now I’m listening to J. A. Jance, Judgement Call. I love Jance mysteries, all of them! Thanks for a chance to win another good book to read. The last book I read was Me and My Big Mouth by Joyce Meyers. It was eye opening to say the least. Right now I am reading Gone Girl. Very good book!! I am currently reading “Mrs. Lincoln”s Dressmaker.” I would love a chance ot win one of Marie”s books. I have read copies of my friends books, it would be nice to have one of my own. The last book I read was Ocean Waves, I would love to get Marie’s book, I will keep an eye out for this one. My last book was The Good Husband of Zebra Drive by Alexander McCall Smith. The last book I read was John Paul Jones by Evan Thomas. I’m reading history at this time. I go in stages about what I want to read. The Chronicles of Nick was the last book I read. The last book I listened to was The Immortal Life of Henrietta Lacks by Rebecca Skloot. I’m about halfway through. I’m finding it fascinating. I’m reading The Mystery Woman by Amanda Quick in hardback as well. I usually have several books in progress at the same time, jumping back and forth as various tasks allow. The last book I read was Star Log Cabin by Eleanor Burns. So clear and clear instructions for Wallhanging, Lap Robe, Twin Size, Double/Queen and Queen/King quilts. I love it. I love making stars and would love to have a copy of this book. Can’t wait to make some of them.